Are you un-baptized but recognize a need for spirituality in your life? Are you baptized Catholic but never received any formal religious education or have never been Confirmed? 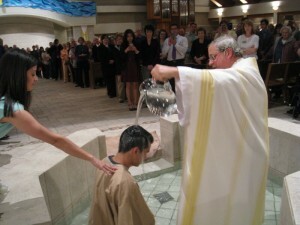 Are you baptized into another denomination and want to become Catholic? Are you married to a Catholic and attend Mass but just don’t know what the next step is to becoming one of the Catholic faithful? 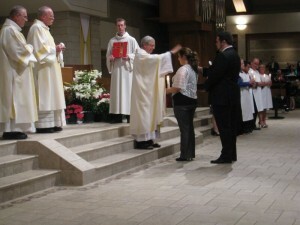 Rite of Christian Initiation of Adults (R.C.I.A.) is a spiritual journey in faith to discover what it means to follow Jesus as a Catholic Christian and the joy and freedom that can result from journeying with Christ. Every year adults are welcomed into the Catholic Community through R.C.I.A. It is a learning and loving process in which conversion of the heart brings you to Jesus Christ who is our Lord and Savior. Baptized Catholics who have never received the Sacraments of Confirmation and Eucharist. Spiritual – candidates attend part of Sunday Mass as a group each week. They learn new ways of praying, and they look into themselves to discover what God is saying to them now. Community – candidates are encouraged to be part of the parish and to attend parish events and celebrations. Service – In the Bible, Jesus directs us to “love your neighbor as yourself”, and lets us know that “whatever you do for the least of my brothers, you do for me.” Following Jesus, R.C.I.A. asks each candidate to participate in acts of service to the needy. Is R.C.I.A. like taking a class or course? It is and it isn’t! Most importantly, R.C.I.A. is a journey which helps a person figure out what God is saying to him or her at this point in life. The emphasis is on personal reflection, prayer, and service to the less fortunate. There are also formal presentations on subjects such as God, Jesus, the Sacraments, and the Scriptures. There are no quizzes or exams. What is the charge for R.C.I.A.? What if I decide I’m not ready? Sometimes people begin the R.C.I.A. journey and, after several sessions, realize they are not ready to be received into the Church. There is no pressure to complete the process, and the door always remains open for them to return to the journey.